We set off after a meagre breakfast of tea and a solitary stale croissant at the hostel. 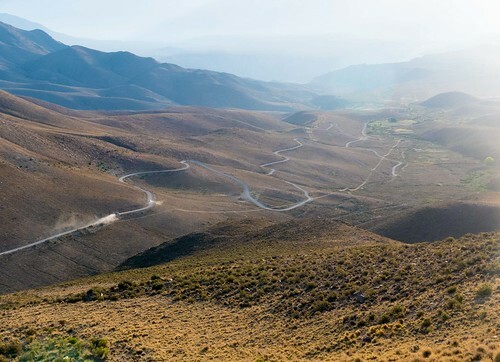 Our trip from Cachi to Tilcara took us on sealed roads for the most part, stretching out as far as we could see. 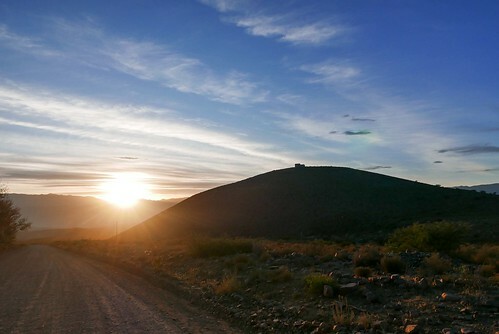 There were a number of viewpoints along the way for us to enjoy, including the "eye of the condor" which provided dramatic views over the landscape making up Los Cardones national park, taking in Cerro Tin Tin and its multi-coloured formations. 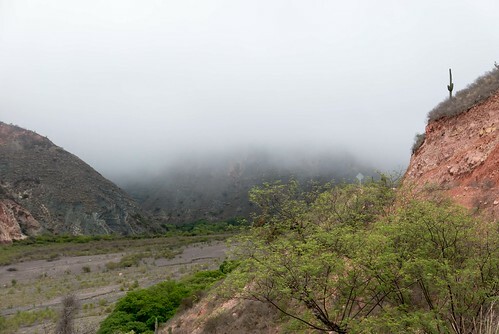 Not too long after, things changed as we drove into a massive bank of fog at just over 3000 metres altitude. 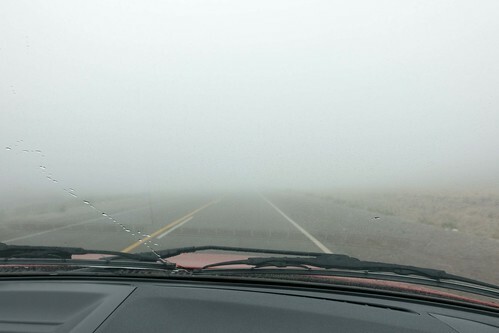 I could barely see 5 metres ahead of me, and someone had forgotten to fit Big Red with a fog light so it was a lot of fun navigating around a twisting mountain road without being able to see a thing. 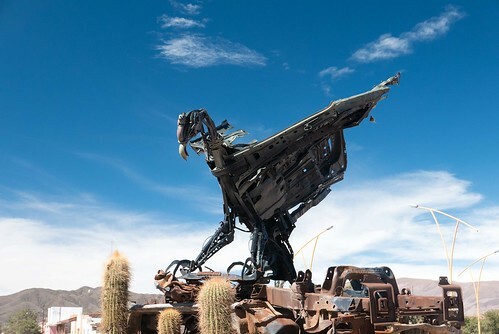 At this point, Gilly was almost grateful for a lack of driving licence. I was beginning to feel the same. Fortunately, once we crested the peak and started making our way down, the fog gave way to more atmospheric clouds which enhanced the environment rather than blanking it out completely. When we were back on more stable ground, we had a couple of encounters with horses and donkeys. 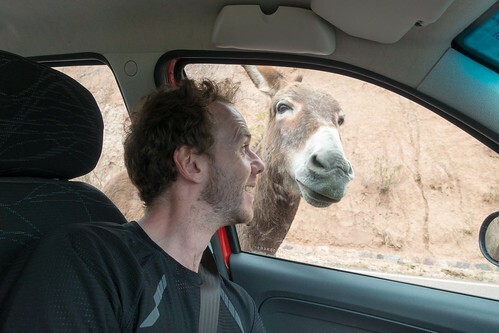 One particular donkey saw me as his kind of guy, whilst Gilly tried in vain to make friends with a horse who turned its nose up at a delicious apple core. 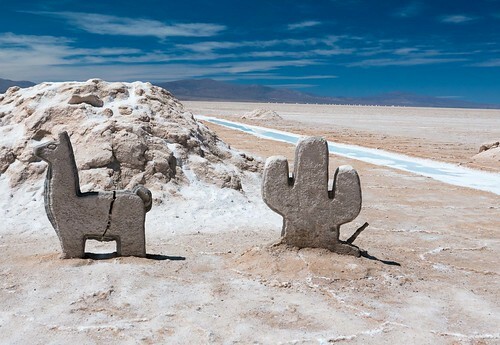 Argentinian horses: not a fan of leftovers. As we were in need of food ourselves, we stopped at a town called General Martin Miguel de Guemes (a lot of Argentinian places are named after war heroes, revolutionaries, liberators and whatnot), for a milanese in the equivalent of a greasy spoon. Flies were everywhere inside, but the food - essentially a breaded steak - was really good. 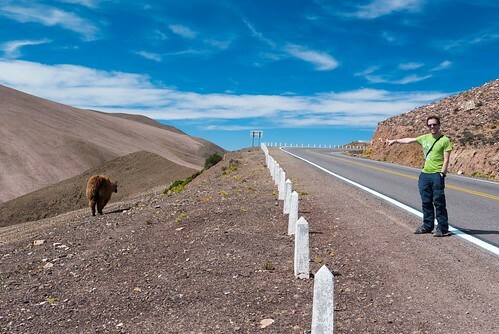 We were about an hour away from Tilcara when we saw a couple of hitchhikers at the side of the road. 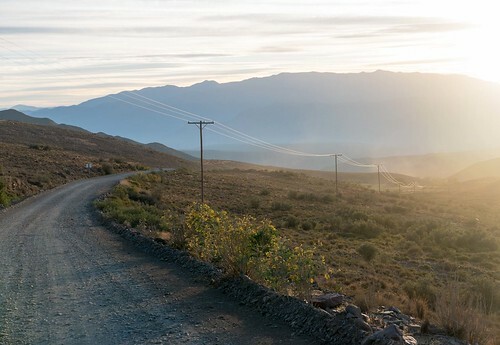 On our last trip, we'd picked up a guy in New Zealand who had been involved in a pretty bad car accident, and dropped him off at a nearby town. 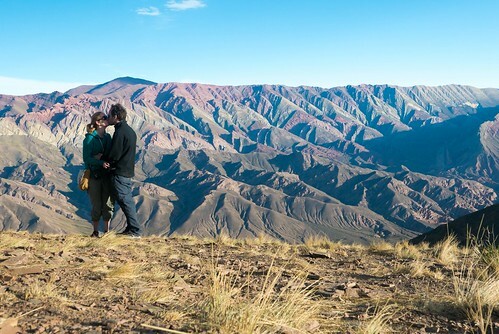 This time, the couple were clearly backpackers and, knowing that Argentina had a reputation for being a popular and safe place to hitchhike, we decided to pull over and pick them up. 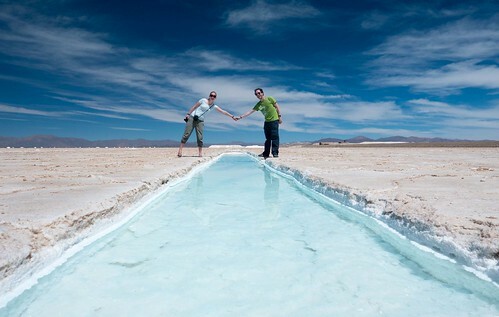 Their names were Ain and Gonzalo, and they had hitchhiked from Cordoba all the way up to the Salta region. They had a few months off and had never visited the north of the country before, so were really enjoying the beautiful scenery. Ain spoke English, but Gonzalo didn't (or at least, he spoke as much English as I spoke Spanish...pretty much zero), so conversations were a lot of fun. Big Red had a USB slot in the radio, so for our trip we'd been blasting out Ben Folds, Smash Mouth, Def Leppard and Lettuce; far better than the samey music we'd heard on the umpteen radio stations in the area, and our guests appreciated the change too - especially Lettuce. It seems jazz funk is ubiquitous in its popularity. They were headed to Purmamarca which was about an hour out of our way, but when we told them we were on our way to Tilcara but we'd be visiting Purmamarca, they were happy to stay with us for the ride. 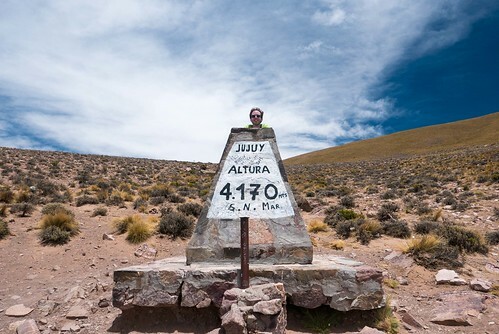 We got to Tilcara not long after, having tasted our first cup of mate in the car. Mate (pronounced MAH-tay) is an incredibly popular drink in both Brazil and Argentina - and possibly other South American countries, it remains to be seen - and it's a kind of herbal tea. You fill a small cup with this herb to the top, and then add hot (not boiling) water to it. The cup has a built-in metal straw, and you sip from it until the water is all gone. Then you top it up again. 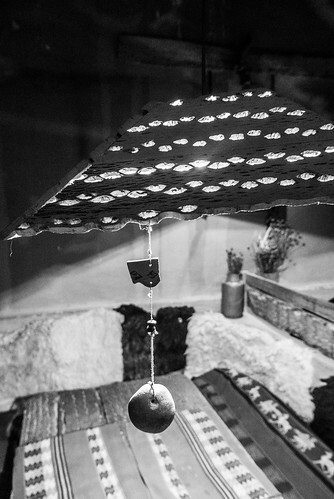 Unlike teabags which are one use only, mate can be used multiple times in the same cup just by pouring water over it. 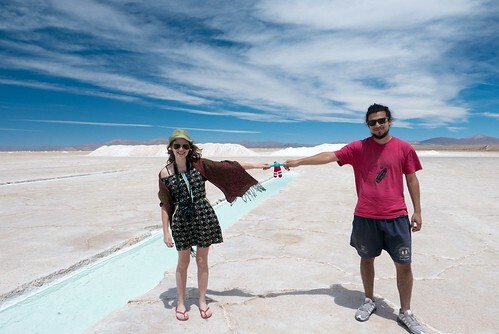 If you go anywhere around Argentina, you'll see people carrying around mate cups and thermos flasks filled with water. I thought the English were obsessive about tea, but these guys take it to another level. After tasting it, I can confirm it's pretty good - like a strong green tea. Not something I'd drink every day, but nice enough. On arrival in Tilcara, Ain did some translation for us with the local tourist office, and pointed us to Club Hostel Tilcara, where we got a massive family apartment for 350 pesos. They were planning on camping, but in the end decided to find a cheaper hostel around the corner. We wandered around the town which, like a lot of the places in this region, looked like something from the old West, and found ourselves feeling a little chilly for the first time in what seemed like an eternity. Breaking out a fleece at the start of summer seemed odd, but the wind really had a bite. 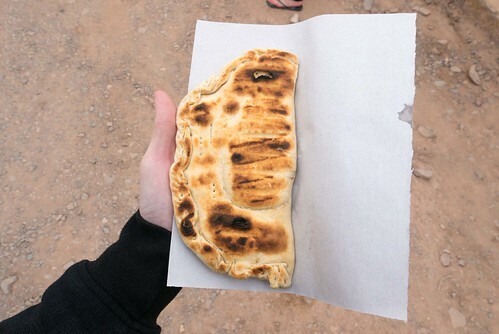 We walked around the market in the main square, and picked up a delicious homemade flatbread filled with ham and cheese from a seller on the street, before catching up with Ain and Gonzalo again. 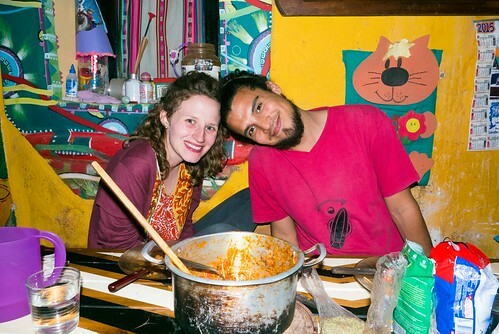 They invited us to their hostel to cook us dinner with wine as a thank you, so we gratefully accepted. Despite the obvious language barrier, Gonzalo and I somehow managed to discuss the merits and drawbacks of both the DC and Marvel universes, and their respective TV incarnations. He wasn't a fan of Jessica Jones, but loved The Flash. Comic book series have a universal language. Since we were going to Purmamarca the next day, we asked Ain and Gonzalo to tag along if they wanted to, which they did. 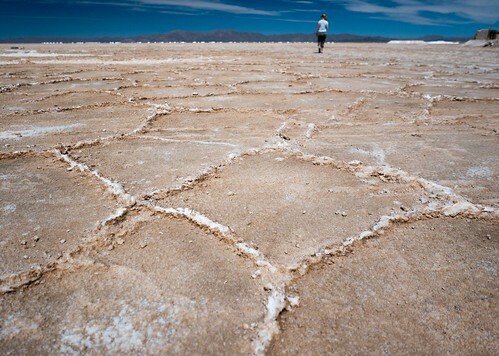 First though, we wanted to go and see the salt flats a couple hours out from that town. 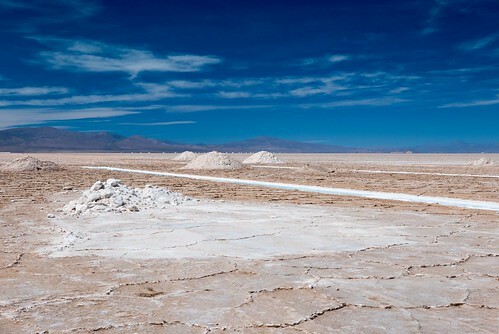 Whilst we didn't expect to experience anywhere near the level of awe we were hoping from the salt flats in Bolivia, we thought that since we were in the area anyway, we might as well go for a drive. And it was quite the drive, taking a road which snaked up the mountain at a considerable ascent. With four people on board and only a 1.4 litre engine, Big Red struggled to get out of second gear for almost the entire way up. 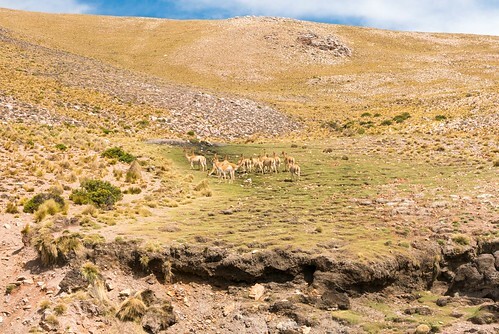 We stopped now and again to enjoy the variations in the mountain ranges (the Argentinians were frequently awed by their country, which was lovely to see), and also to snap our first wild llamas. I've no doubt that we'll be sick of llamas when we we eventually leave Peru, but for now they're a novelty. Once we got over the ascent, the drive down was fantastic. 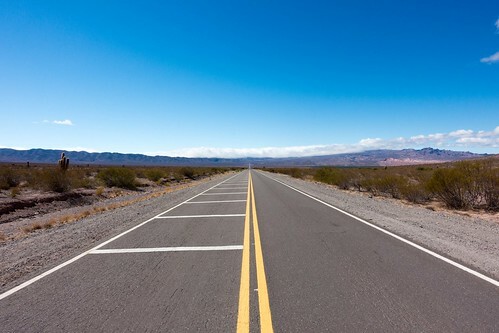 Since I could see the road for miles ahead, it was obvious that there was no other traffic coming, which meant I could pelt it down the middle of the road Argentinian-style, and take corners like I was a star in a reasonably priced car. Well, I was in a reasonably priced car. 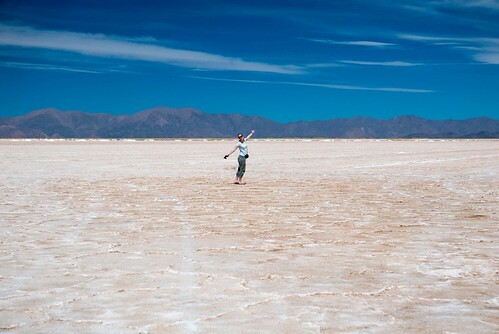 The salt flats themselves were OK. 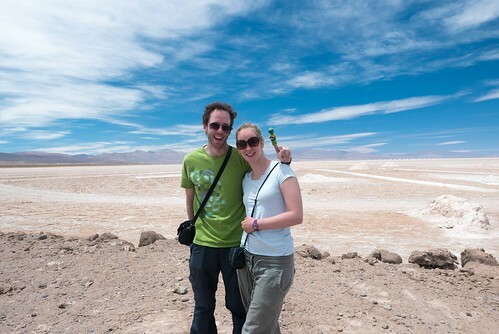 They were a lot less white than I was expecting, but there was an otherworldly nature about the contrasting landscape and the deep blue of the sky which made me feel excited about what we'd see in Bolivia. 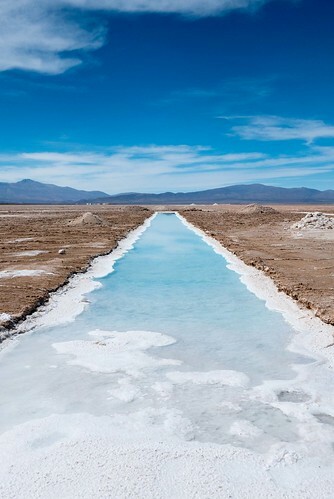 There are hundreds of trenches cut into the flats which are used to collect salt deposits, and these stretch out for kilometres into the distance. Despite the sun, it wasn't crazily hot which was a relief. 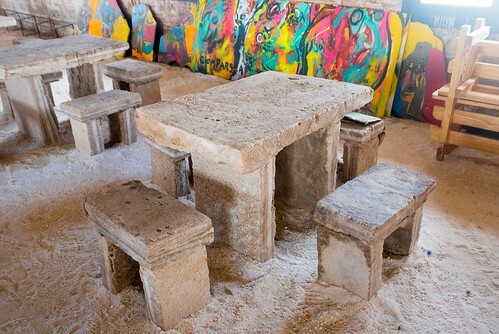 We saw a house which had been entirely made out of salt - the bricks, roof and even the furniture inside had been carved out of the local area. When our companions saw that we were taking a mascot around with us, they decided to buy their own: a finger-puppet Ninja Turtle. They chose Leonardo who is clearly inferior to Donatello but each to their own, I guess. 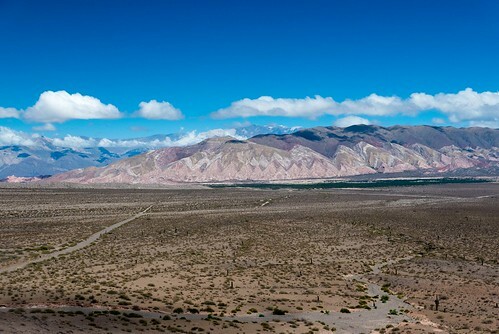 After a trip to a high point in the Jujuy province, Purmamarca was next. 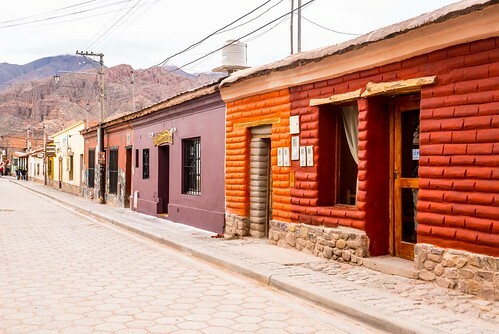 The big draw of the town is its seven-coloured hill which is what Ain and Gonzalo were keen to see. First though, we needed food so Ain tracked down a good value local empanada place (Casa del Molles) which also served a llama stew. We ordered a couple between us, and my verdict is: chewy. It was like lamb but without quite as strong a flavour. I have been told that Mr Llama tastes even better as a burger, which I can believe. As for the seven-coloured hill, it lived up to its name even if it wasn't easily accessible and we had to snap it from a distance. Purmamarca was supposed to be a quaint little town, which it was, but it was also dusty and a little too quiet for my liking. I'm glad we didn't decide to stay there, though it was nice to visit. We drove back to Tilcara where we dropped off Ain and Gonzalo and said our farewells, and they gave us a magnet they'd made as a thank you. They have dozens of them, all unique, each with a photo they have taken. 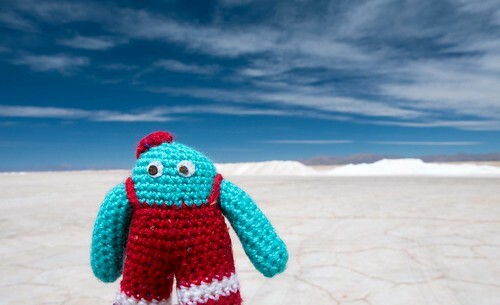 They are selling them as they travel to try and get a bit of spending money to subsidise their trip and some of the photos are fantastic. Hopefully we'll get to see them again some day; travelling is transient by nature, but there's always Facebook to keep in touch. 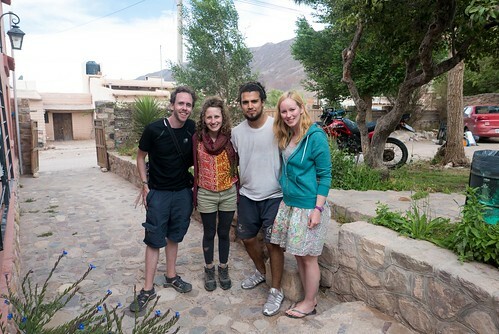 We arrived in Humahuaca in the afternoon, which is where we planned to stay for a couple of nights. Our lodgings that night were at El Sol Hostel de Humahuaca, where we were clearly the only guests in the entire place, and where the internet was apparently down for the entire town. We didn't hang around too long though, Joe and Lorena from a couple of nights previous had recommended going to the Hornacal. 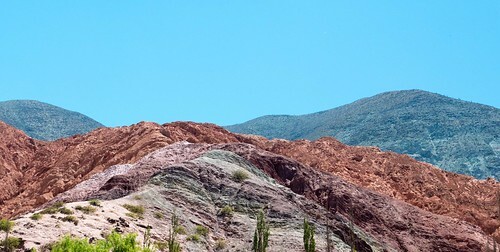 This is a mountain range that allegedly has not seven but fourteen colours, in some sort of geological oneupmanship with its neighbouring town. Another hour's drive along a gravel road, following a pretty sketchy path on our mapping app, and we finally spotted the turn-off. After paying 30 pesos to an old lady who was obviously part of the indigenous tribe in the area for entry onto the land, and we reached our destination. 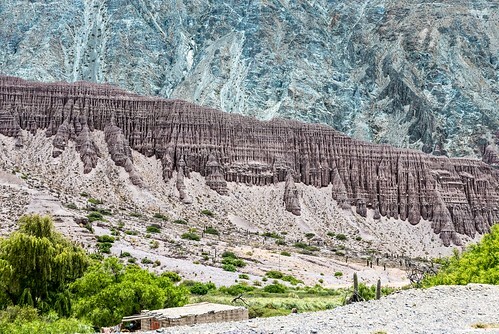 In truth it was far more impressive than Purmamarca's paltry seven colours, but my novice's eye failed to pick out fourteen unless you count slight variations on brown - which the tourist board no doubt do. The sunset on the way back to town was also fantastic, although it distracted me enough to take a wrong turning at one point. Luckily I noticed before we got too far out of our way. 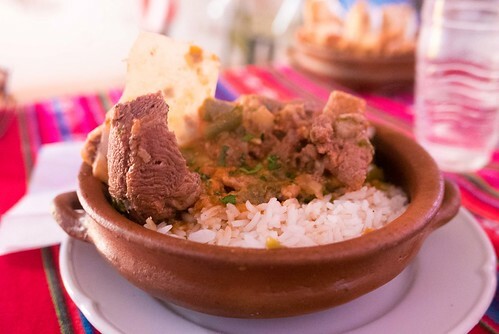 Back in Humahuaca for a chilly walk into the centre, we ended up at El Portillo restaurant and enjoyed a good value menu of the day in kooky surroundings with Norah Jones playing in the background, whilst a cute dog sat under a nearby table. 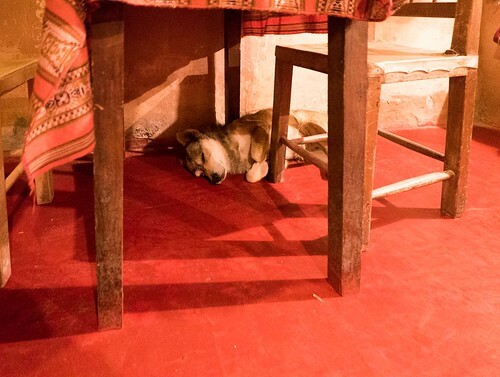 Dogs can come and go as they please in restaurants. If that were the case in the UK, our population would be 48% happier, statistically. I also noticed that they were offering rooms, so asked to see one and immediately snapped it up for the following night. Right in the centre of town, a much nicer bed, en suite instead of an outhouse bathroom, and more than one plug socket...for only 50p more. Sometimes, reliance on booking through websites means you miss out on gems like this. Thinking about our last trip, we would almost always rock up to a place and then try and find accommodation. It was a pain at times, but we did end up staying in some great guesthouses for very little cost. This time, we are prioritising the security of having a place to sleep, but if a town is small enough it's still worth a mooch around after the first night to see what else is about. We were going to have a proper look around the town the next day, as well as taking a day trip to a neighbouring town called Iruya.